In my last tutorial I mentioned that I would make a detailed post on drawing eyes from the side. I said that I would post it in a few days… However, I didn’t expect it to take more than two weeks! This is what happens when I procrastinate. But hey, I did manage to pump out two tutorials this month :) Not bad eh? If you landed on this page first, you may want to check out my previous tutorial on drawing faces from the side. Use your HB pencil to draw a circle with a small bump (cornea) on one side. Starting from roughly the center of the eyeball, draw an obtuse triangle. Make sure the cornea fits inside this triangle. Draw a curved line to connect the top and bottom parts of the cornea to form the iris. Add a thin oval inside the iris to form the pupil. Erase everything outside of the triangle as well as the triangle’s right side. Give the remaining sides of the triangle a more natural contour. Then draw the upper and lower eyelids. Using your HB mechanical pencil, draw an outline of the glare in the eyeball. This can be any shape and size you want. Keep this area as clean as possible. Shade the pupil using a 6B pencil. Use a dirty blending stump to shade the iris, making sure not to smudge the pupil. Grab your HB mechanical pencil to draw spokes in the iris. Start from the center of the pupil and work your way out so the starting point of each ray remains consistent. You can curve the base of each spoke to add more depth. Go over some of your spokes again with a 4B mechanical pencil, draw a wave-like pattern around the pupil, and/or add small slits randomly in between some of the spokes. Use a blunt HB pencil to shade the white area of the eyeball. Depending on where your light source is coming from, you can draw some cast shadows from the upper or lower eyelids. You can add some subtle veins using a sharp H pencil. Then, soften your shading with a tissue. Use a 4B pencil to shade the upper and/or lower parts of the iris to add more depth. You can make the fold of the upper eyelid deeper by going over it with a 6B pencil. Use your sharpened 6B pencil to draw the eyelashes starting from the root of each hair. Press and flick your strokes to make the roots thick and the ends nice and thin. You may need to sharpen your pencil every 2 or 3 lashes. For lashes that are close to the corner of the eye, use an HB pencil to draw them in lightly. Draw the eyebrow using a mechanical HB pencil and a lighter flicking motion. Follow along the brow bone and arc the eyebrow around the eye. Avoid pressing too hard at the beginning of your strokes to keep the root of each hair fairly thin. Lighten your strokes as you approach the eyebrow’s tail. For a more detailed tutorial on how to draw eyebrows, click here. If you enjoyed this tutorial on how to draw eyes from the side, please share it with your friends using the share buttons! If you have any questions, please let me know in the comments below! Want more? 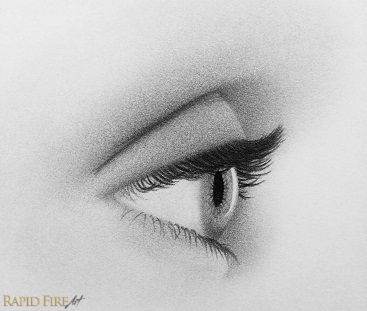 Click here to learn how to draw an eye from the front! GREAT JOB!!! THANK YOU!THANK YOU VERY MUCH!!! Really loving all your tutorials, you break it all down in such easy to follow steps….I am for the first time, actually drawing features that look realistic and are shaded correctly. You are awesome! Thanks for the excellent step by step tutorials. I’ve always wanted to draw but never had the time or instructions. Your easy to follow steps have given me the basics I need to get started! Your tutorials are excellent. I’m getting great results. Keep ’em coming please. That’s great to hear Shaun! super sister you have more skills!! But can you learn me how to draw 3/4 eyes? And please keep making tutorials! Can you tell us how to draw 3/4 eyes? Mine turned out great, but I put my own bits in it. Thank you! Thank you for sharing your artistic skills. Your instructions were some of the best that I have seen. Thanks for the feedback Bobbie! Lol steht Step 8 – magic happends! this is a grate helpful tutorial for a beginner like me.